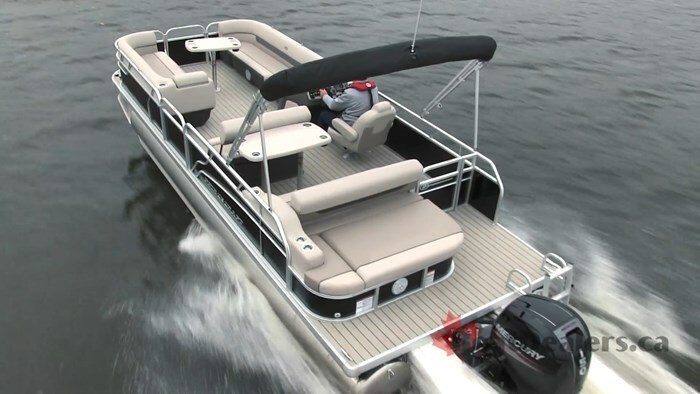 Today’s pontoon boat offerings start at pure simplicity and there seems to be no end to where you can go with options. 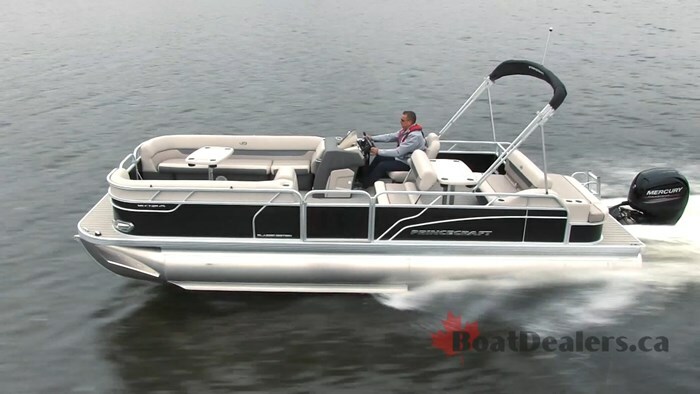 The Vectra Series from Princecraft has always focused on simplicity, the new 25 RL model adds practicality with a blend of style, tosses in a ton of fun while maintaining affordability. 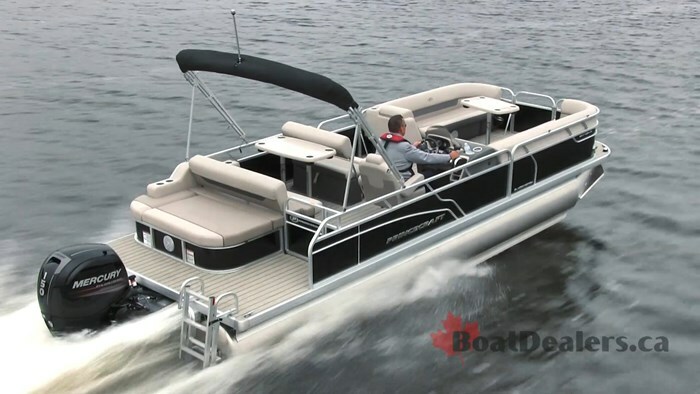 The base of this boat is constructed using the same 5052-H36 marine grade aluminum alloy, the same 2 ½” heavy duty extruded Z-aluminum cross channels, the same 1 ¼” anodized aluminum rails, the same sealed pontoon bulkheads and the same pressure treated ¾” wood deck as most of their other pontoon models. In other words, what’s under the water on this affordable model is the same as what’s under the water on their luxury lines. 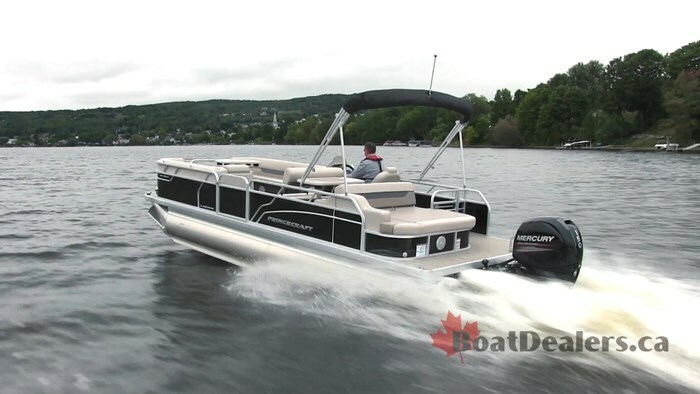 There’s a passion here for allowing consumers to option out the Vectra 25 RL to meet your specific needs and this is exactly where you want your pontoon partner to begin. Only you can determine what is best for you and your crew so start by determining the size of boat you need, think about the comforts that matter, the type of on water activities you desire and of course the budget that you have in mind. Once you’ve got your list take the base boat and outfit it with the options you need. 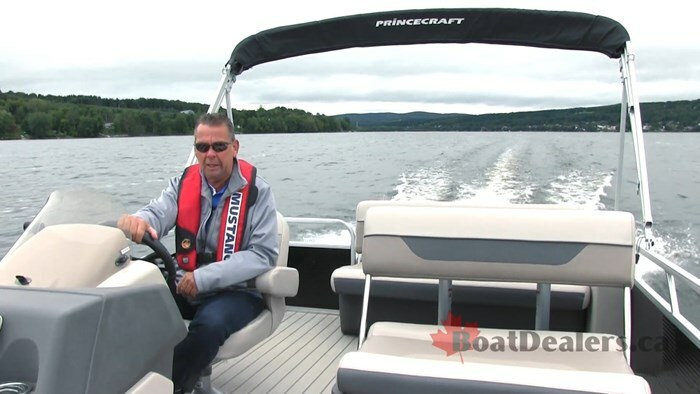 Our test boat was outfitted with a number of very sensible and yet still affordable options including the Sport Configuration which gave us the 3rd pontoon log, lifting strakes and under deck spray shield. Mercury’s 150 outboard with hydraulic steering was included as well as the Premium Classic Edition with an array of LED lighting, deluxe helm seat, upgraded steering wheel, chromed docking lights, chromed cup holders and chromed horn housing, a very cool rear dinette package with flip flop seat, gray vinyl floor with black lines and a pop up privacy enclosure. 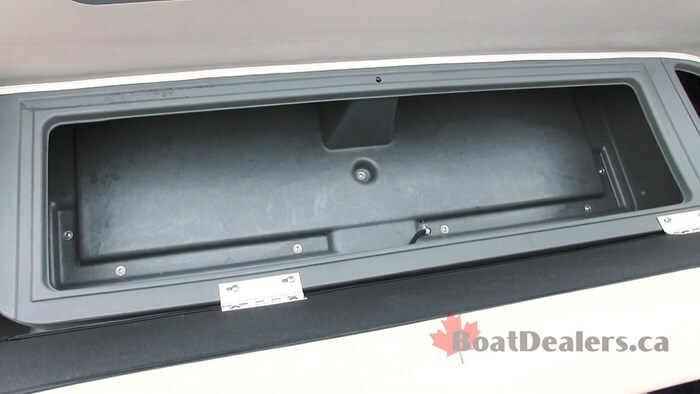 The only option missing for my crew was a waterski tow bar – but that’s an easy option to add if it’s important for your family. There’s no mistaking that at 25’ 8” overall length the Vectra 25 RL is a big boat and the lines in the flooring run bow to stern giving her an even bigger feel. 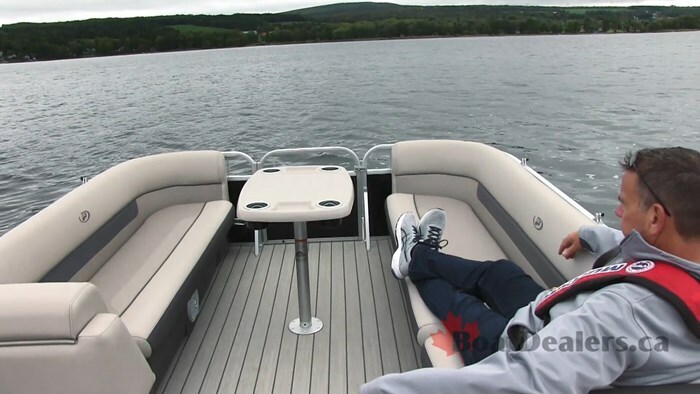 She’s incredibly spacious, the starboard side forward lounger runs from the front of the helm station all the way to the fence – I stretched out my 6’1” frame and could have easily had a couple of adults sitting in front of me. I appreciated how much storage was available under every single lounger and the fact that the new grey roto molded self draining seat bases will take care of maintaining my gear while its stored away. The rear dinette package is beautifully designed in it’s simplicity and functionality. There’s generous space here for at least 5 or 6 adults with a massive table and comfortable seating. Both seat backs in this area can be positioned towards bow or stern so if you’re rafting and want a massive rear lounger you can have it, if you’re running and want a wide seat for a couple passengers beside the captain you can have that too. Every boat has to perform well – whether it’s an affordable model or a luxury design, performance is always critical to customer satisfaction. I was very pleased to experience how incredibly well the Vectra 25 RL performed. On a chilly September morning at 11 degrees C with 2 adults and a light load of camera gear as well as ½ tank of fuel the Mercury 150 eased us away from the dock with a whisper. We moved into open waters and quickly found cruising speeds of 18 & 24 MPH – in both cases we found a trim level slightly under half suited us best. Hole shots were an impressive 3.49 seconds and our top speed trials were a consistent 38 MPH at ¼ trim. When my passenger moved to the photo boat I had the pleasure of running the Vectra alone and pushing her into a series of turns and slides with ease. She tracked perfectly, the lifting strakes did their job flawlessly to get us on plane in a hurry and the under deck spray shield did it’s job in keeping the water where it belonged. Even with the limited amount of trim I was applying the bow raise was perfect and at top speeds the water was spraying off the back 4’ of the boat. 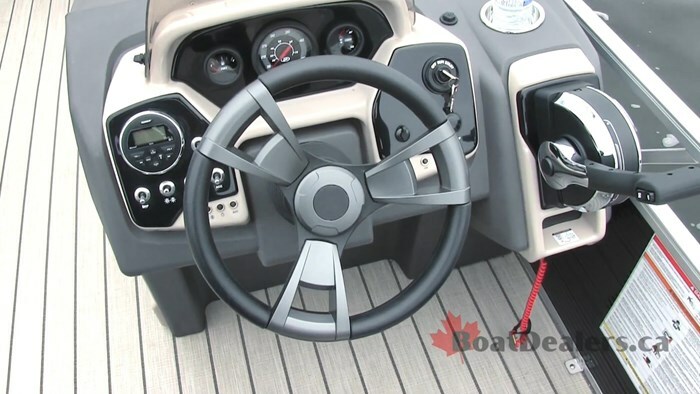 Just because we want an affordable boat doesn’t mean we have to give up functionality or fun. 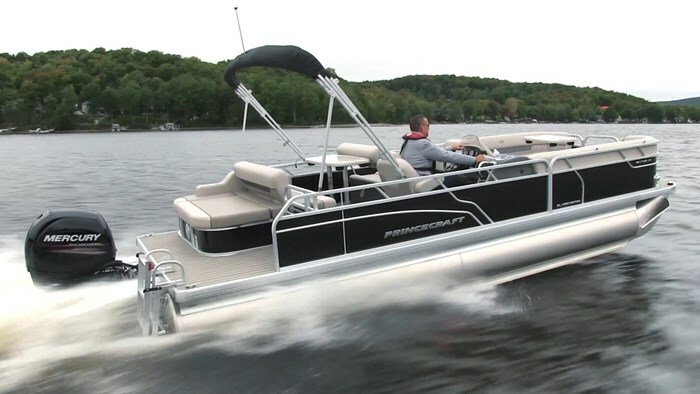 The Princecraft Vectra 25 RL is functional in it’s design, it’s practical in it’s layout and it’s an absolute blast to drive.